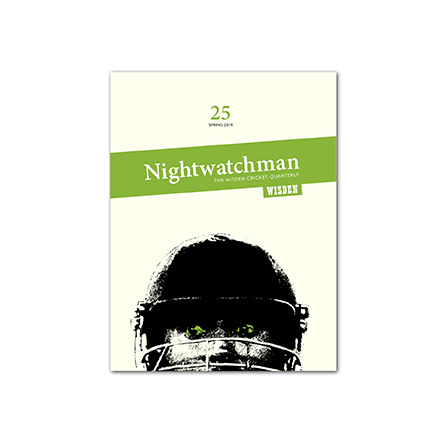 The Nightwatchman is printed, packaged and distributed by All Out Cricket Limited on behalf of John Wisden & Company Ltd. These terms and conditions (Terms) govern your use of this website and any connected services that are provided by All Out Cricket Ltd (together referred to as the Services). By using the Services, you will be deemed to have read, understood and accepted these Terms. The Services are provided on an ‘as is’ basis without any warranties of any kind, and to the fullest extent permitted by law we will not be liable for any inaccuracy or omission in the information provided by the Services or any interruptions in availability of the Services. The website may from time to time invite you to comment on articles and join in correspondence. By contributing you are granting us a worldwide, non-exclusive, perpetual, royalty-free licence to store your contributions on our servers and to display the contributions on the Services. We can’t promise that we will use all contributions provided to us. We want to keep the websites clean and friendly. Please ado not submit contributions that are offensive, racist, harassing, illegal, misleading, abusive, defamatory, obscene or otherwise objectionable. We do our best to monitor and moderate contributions but we cannot monitor them all and you therefore could be at risk yourself if you contribute anything objectionable. As you might expect we reserve the right to take down any contribution that breaches any of the above rules, and we may be obliged to pass copies to appropriate authorities. We reserve the right, among other things, to suspend or terminate your access to the Services if you are in breach of these Terms, for example by submitting contributions that are unsuitable. One entry is permitted per household, and no bulk or third party entries are permitted. If we run a competition or offer with a promoter where that promoter is responsible for the provision of the offer or prizes then All Out Cricket Ltd will not be responsible for or have any liability for the provision of those offers or prizes. The closing date for receipt of entries is as stated for each individual competition. The winner(s) will be drawn at random from all valid entries, and will be notified by email within two weeks of the closing date. Detail of the winner(s) can be obtained by sending a SAE marked [name of competition] to All Out Cricket Ltd, Unit 3.40 Canterbury Court, 1-3 Brixton Road, London, SW9 6DE, United Kingdom within 21 days of the closing date of the promotion. Some cricket equipment given away in competitions may have been used for testing purposes. Subscriptions run for a 12-month term and unless you cancel the payments with PayPal prior to the renewal date payment will be taken automatically with no warning. If you wish to cancel a subscription after payment has been taken we may refund you an amount calculated by removing from the full subscription amount the single issue price of any editions that were released prior to cancellation, any associated postage costs and an administration fee of not less that less £5.00. ‘All Out Cricket’ is a trademark belonging to us. All other trademarks used on the Services are the property of their respective owners. No licence or consent is granted to you to use these trademarks in any way, and you agree not to use these trademarks without our prior written permission. Notwithstanding the above, nothing in this paragraph ‘Liability’ limits or excludes our liability for any matter for which it would be illegal for us to limit or exclude, or attempt to limit or exclude, our liability.